Today we continue the presentations for the participating clubs in the 2010/2011 EUROHOLD Balkan League. The third and last, but of course not least Bulgarian club is Balkan, from Botevgrad. This is Balkans debut in the EUROHOLD BIBL, as the club finished third in the NBL in Bulgaria last season. Balkan is Botevgrads main sport attraction, as the people in the town situated 50 km away from Sofia live for the teams performances. The club is very succesful on the basketball scene in Bulgaria, having won the championship 4 times - in the early 70s and late 80s along with 4 national cups. 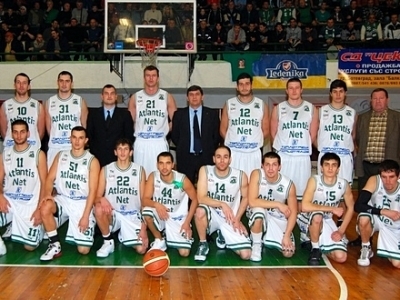 The Greens also have been runners up two times, most recently in 2008, and have won the bronze medals in the NBL 6 times, including this season. For the upcoming season, they have already secured the services of Bulgarian NT center Krum Doychinov from Euroins Cherno More, along with Serbian coach Mile Protic, who is going to be in charge of the junior teams. The team plays its home games in Balkan Sports Hall, with capacity of 1000 people. The teams head coach is Petar Klechkov.